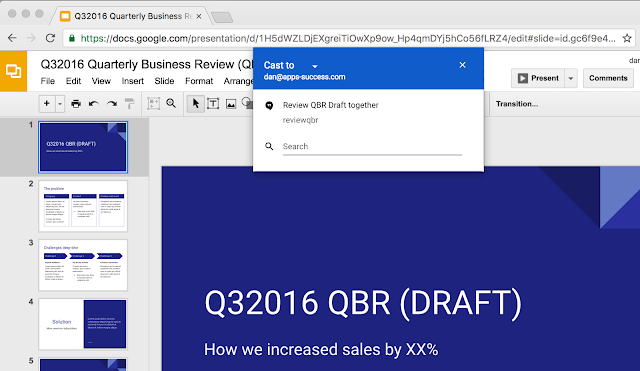 With this launch, signed-in Chrome users on Chrome 52 or higher will be able to use the “Cast…” menu item from Chrome to share the contents of a browser tab or their entire desktop into a Hangout. Hangouts that are scheduled on the user’s Google Calendar are shown automatically, but they can also be joined manually using the “Search” text box. Google Cast does not need to be installed on the user’s machine, as this is now natively available in Chrome 52 or higher. We hope this makes the feature easier to roll out to users, allowing screen sharing to be just 1-2 clicks away. Google offers its Google Apps customers useful and simple-to-use video chat features to make communication better. Whether communicating changes to remote teams, presenting demos to stakeholders, or just getting things done quicker in real time, screen sharing is an effective way to present content to your audience. That’s why we’re excited to roll out a new integration between Google Chrome and Google Hangouts that makes screen sharing from your Chrome browser to a Google Hangout easier than ever before.